Since the day wolves were allowed to reclaim their niche and re-establish the balance in the Yellowstone ecosystem, some of the questions on the minds of biologists and casual observers alike have been, “How will they get along with the park’s grizzly bears? 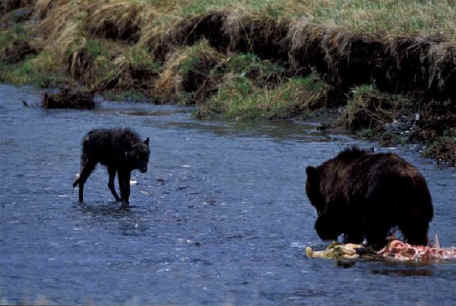 Will wolves and grizzlies avoid one another? Will they fight? 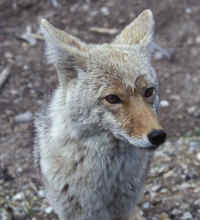 If so, who would win and who would back down from such a contest?” After years of visiting Yellowstone to photograph wildlife, I finally saw some of the answers to those questions played out during several encounters in May of 2004. The first of these was in the Hayden Valley. Typical of most wolf or grizzly sightings in Yellowstone, without powerful optics, the distant animals appeared only as moving dots on the horizon. But through binoculars it was apparent that a wolf dot was clearly chasing a young but determined grizzly dot, presumably away from the remains of a kill made by the local wolf pack. 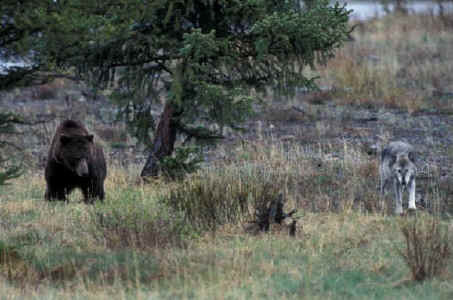 Next, a larger grizzly showed up and also chased the young bear before moving in to claim the wolves’ food. Reluctant to challenge this older grizzly, yet not wanting to give in too easily, the wolf made a show of chasing the beleaguered younger bear further away for good measure. 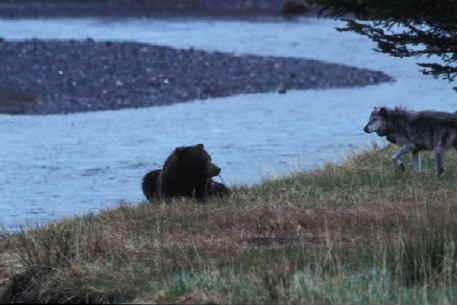 It seems that while grizzlies are learning that wolves can provide an important source of spring carrion, wolves are learning which bears they can successfully challenge and which of them will not budge.